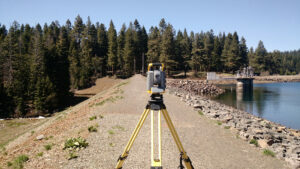 Adkins’ survey team is the region’s most experienced having completed over 2,000 land surveying and staking projects in Southern Oregon and Northern California over the past 30 years. Adkins was selected to provide surveying and materials testing services for the North Ridge Superfund Site and Borrow Pit. Adkins’ survey team performed recurring topographic surveys of the remediation site and borrow pit, as well as laboratory and field testing at varied intervals. The long-term result of this project will be the re-habitation of the new homes that were abandoned due to asbestos contamination in the soil. 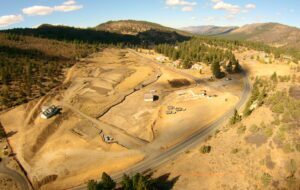 The Hyatt Dam Modification project consisted of adding several layers of sand, drain rock, earth, rock, and footing drains to the existing face of the Hyatt Dam. Studies had indicated that the dam structure could be subject to breach during certain seismic events. This project’s purpose was to modify the existing dam face with a filter system, allowing seepage from the dam face to be managed, minimizing the chance of dam failure. Adkins performed pre-construction survey, and prepared the NPDES stormwater discharge permit. 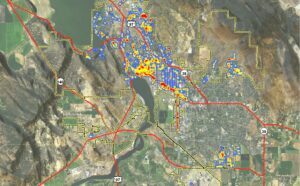 Adkins partnered with the City of Klamath Falls to inventory more than 2,000 City storm system structures. The Project Included locating existing catch basins, manholes, outfalls, and drainage features; inspecting and photographing structures and pipes, and generating a complex GIS database for the City to integrate into their existing GIS applications. This project played a key role helping the City to plan future maintenance and rehabilitation operations. Adkins recently performed survey mapping, a draining structure inventory, and stage/storage water volume calculations for 62 units in the Lower Lake Wildlife Refuge. This comprehensive survey included LIDAR and field-collected data encompassing nearly 40,000 acres of land and nearly 500 drainage structures, pipes, and canals. Adkins surveyed and prepared a systemwide inventory and mapping of over 100 miles of sanitary sewer infrastructure. The topographic information collected was used to build a GIS database for the District’s system, which will be used for asset management moving forward. Adkins completed a comprehensive mapping project for the City’s water system, including seven miles of pipeline of varying age, type, and size. Data collected for this effort was used to model the water system as a part of the Water Master Plan. We have also performed all surveying, mapping, and inspection services for the water and wastewater infrastructure.